Joan Trumpauer Mulholland grew up in Arlington and Fairfax, VA. 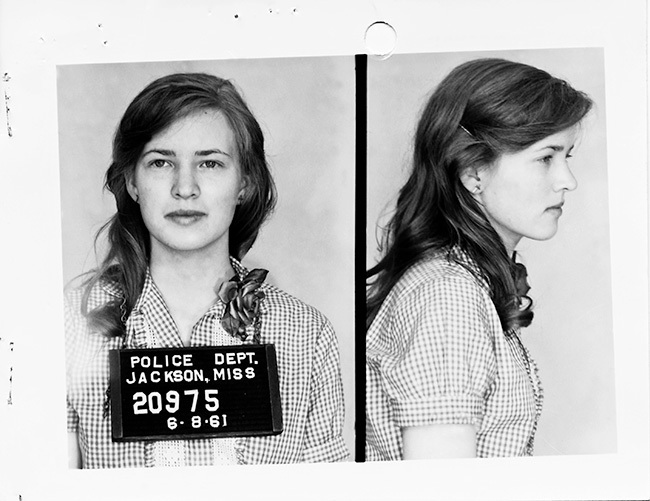 In 1961 she was living in Arlington and working on Capitol Hill, active with the Nonviolent Action Group protesting segregation in Washington, northern Virginia and Maryland. After the Freedom Rides she transferred to Tougaloo College in Jackson, MS, graduating in 1964. 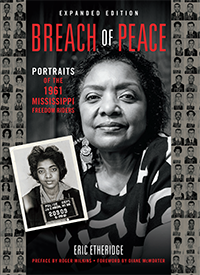 She was active in the movement while in school, working alongside Medgar Evers, the field secretary of the NAACP in Mississippi, as well as many others. Evers was murdered in Jackson in 1963. In 1964 she returned to Arlington, where she has lived since. She worked for the Smithsonian, and in the Department of Justice on a program helping communities resolve racial issues. From 1980 until her retirement in 2007, she taught in the Arlington public schools. Election Night at last. I was too road weary from a 24+ hour marathon journey home from Labrador to Arlington, VA, to go anywhere and watch the returns with people. Instead, wearing my Obama T-shirt, I half listened to the early returns while going through six weeks’ worth of mail. And hoped I could stay awake until there was a winner. Then came a call from my friend Jodie in Makkovik, Labrador. She’d finally gotten the kids down, her husband was off on a two-week shift in the nickel mine in Voiseys Bay, and she wanted to share the evening with someone who’d understand — like me. So, connected by the phone, in our matching Obama shirts, tuned to different networks, we watched the returns together. We compared projections, discussed the intricacies of the American electoral processses, and considered the world-wide implications of what was happening. Finally, with reports that Obama had hit the magic number, there were scenes of world-wide celebrations that made the Millenium look like a warm-up rally. Jodie was having chills from the excitement. My sister called, screaming so uncharacteristically that at first I didn’t recognize her voice. But I was in a somber mood, and not just from exhaustion. My mind was on all it had taken for us, as a nation, to “come this far.” I was remembering people, especially friends killed in the struggle, who had not lived to see this day. It had taken so many giving so much. A couple of days later I went. Yes, Medgar, it was not all in vain. You’d hardly believe how much has been accomplished. There’s much to be done yet, many hearts and minds to be touched still, but things you could only dream of have happened. There is HOPE, and CHANGE is in the air. Thanks, Medgar, for doing and giving so much to help make America true to itself. I lingered awhile at his grave. Then I moved on to the graves around his — men from many states, all equal in death. Nearby was a section of World War I veterans, men lucky enough not to be resting in Flanders Fields. It was getting on toward dusk, time to leave — the cemetery and the past — and step into the present. For me, the trip to Medgar’s grave was like a bridge from what was to what can be. Now I’m looking to the future, feeling that my country is rejoining the circle of nations. CHANGE (the positive kind) is in the air once again. It’s been a while since I had time to sit down and read these posts from the last month, but as always, I am truly overwhelmed by these first-person accounts from the Freedom Riders. The picture of Medgar Evers’ grave is quite humbling as well as the idea of placing an Obama button there. I do hope that you will find a way to publish or preserve these interviews! For now, I’ll just have to print them out on my computer (smile). Thanks so much for recording these valuable voices. I do hope that you will find a way to publish or preserve these interviews! For now, I’ll just have to print them out on my computer (smile). Thanks so much for recording these valuable voices.